Hey y'all! I'm still here. My hubby and son and I just got back from a week on Block Island but I'm still technically not home. We're renovating our bathroom so our apartment is now a make-shift work station for our Ukrainian contractor. It is uninhabitable at the moment, so I've come home to re-shift our travel gear before we head out to the Jersey Shore for a few days. I hate house-hopping. Hopefully, I'll be able to shower in my home by next week. I'm one of those crazy people that hates coming home to a dirty house, so I am really feeling frazzled and discombobulated right now.. But anyway, I am doing very well in the real world now that I'm eight weeks out of fitness rehab. Vacation on Block Island was a lot of fun. I ate and drank - not always in moderation - but I also exercised. I ran three miles, three times and did DVDs three times. Not bad for a beach vacation eh? The thing is now that I'm back but "homeless", I'm really freaking out about when I can get a good workout! I hate going for more than three days without exercise, and now that I'm in full summer celebration mode, I have to exercise frequently if I want to enjoy a few cold brews and/or an ice cream cone. It's simply not negotiable. Hopefully, I'll get a good run tomorrow. I love that my mindset has changed so much! Okay, I have to go before my son slices his hand on the contractor's band saw. I hope you're enjoying these last precious days of summer. Have fun but stay accountable! 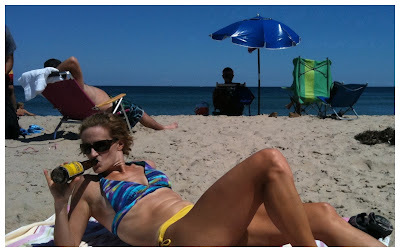 I earned that beer after running three miles of Block Island hills!